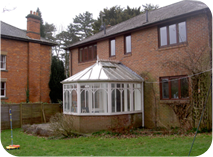 We are currently working on a scheme to design an extension to a 1970s house, replacing an existing conservatory. The conservatory is dated and has no conection to the garden at the rear of the house. Also, the living room is long and narrow and has no focal point. 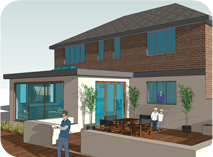 Our solution is to design a link between the kitchen/dining area and the new extension that will include an informal living area overlooking the garden as well as the new patio area. This design greatly improves the flow between the kitchen, dining, living and patio areas. In the formal living area we have incorporated an inglenook fireplace. This fireplace changes the proportions of the room and gives the room a focal point. We have produced a 3D-walkthrough film that shows how the areas connect and how the design opens up the ground floor. A 3D visualisation is a wonderful way of showing the client how the scheme will look. It is also a valuable design tool, as the scheme can be changed and the impact of changes can be seen by the client.